Are you looking for a reliable Pet Sitter? ​Your pets can stay home! 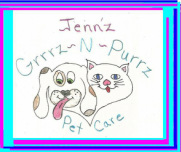 Jenn'z Grrrz-N-Purrz Pet Care is a family owned pet sitting business located in Clarksville, Indiana. I offer pet sitting, dog walking, and pet taxi services to the Clarksville, New Albany, Floyds Knobs, Charlestown, Sellersburg and Jeffersonville, Indiana areas. *Insured and bonded through Pet Sitters Associates LLC.